Getting into the party spirit, Alfreton Golf Club held its annual Christmas Party on 16th December. 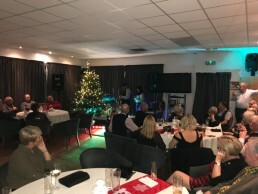 Regular visitors, live band SAXY, returned to perform two sets of music either side of a buffet meal and a rock and roll music disco to end the night. 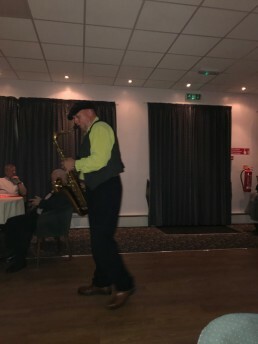 It was great to welcome ex ‘employee’ Honestey Short who sang a range of songs alongside accomplished saxophone player Richard Penarski. The dance floor soon filled with enthusiastic members all getting onto the seasonal mood. Thanks also goes to Ange and her staff for providing an excellent spread to give people the energy to keep going til midnight and beyond.